Scott Blake makes art with barcodes, creating mosaics that have both form and function. His art, inspired by the Y2K computer crisis, started with circles, squares and tile patterns that morphed into lines and eventually became barcodes. Blake has made more than 30 large-scale digital portraits of cultural icons using actual UPC numbers connected to some aspect of their lives. 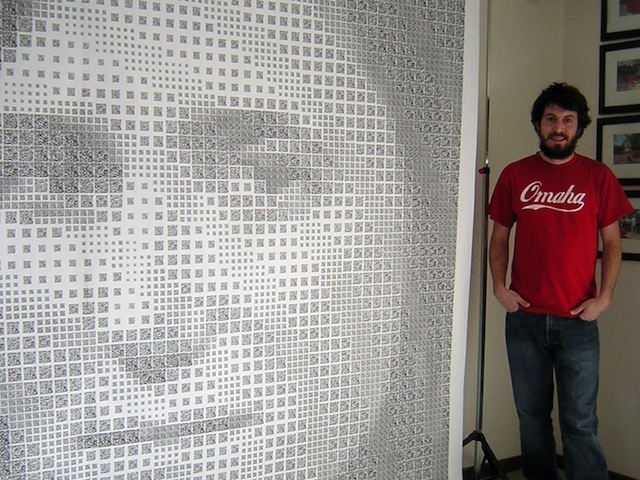 "Barcode Elvis" portrait is made from barcodes from his music CDs. "Barcode Bruce Lee" and "Barcode Marilyn Monroe" are comprised of barcodes from DVDs of their movies. "Barcode Oprah" consists of ISBN barcodes from Oprah's Book Club. Interact with this art. Scan the barcodes with your smart phone. Move beyond form to function.